The Nikon P-223 3-9×40 Matte BDC 600 is one of the best riflescopes for multiple styles of shooting. You can take it on the range or just use it for tree stand hunting. It has impeccable precision adjustments and great clarity from its multicoated optical system. It has a great eye relief and magnification of up to 9x for those long range shots. For those who have to adjust their scope quickly to get their target, this riflescope is designed specifically with this purpose in mind. BDC 600 Reticle – This reticle was designed to be used for the .223 Rem / 5.56 NATO round which is manufactured as a polymer tip bullet. The bullet is of the 55-grains line. With this reticle, you will be able to shoot hash marks that are anywhere from 100 to 600 yards away. Positive click reticle adjustments – These have a zero-reset functionality so that your adjustments will always remain in place until you reset them yourself. The adjustments are 1/4-minute on angle. Parallax setting of up to 100 yards that removes any parallax when you need to be precisely on your target. Waterproof and fog proof with Nitrogen in the interior and an O-ring to seal out the exterior. Sufficient eye relief to make sure that you do not damage your brow from the recoil of your rifle. The Nikon P-223 riflescope has an effective objective magnification range that goes from 3x to 9x. This makes it perfect for many different AR platforms. It also means that you can use it for different types of shooting like on the range or even hunting. It has a wide field of view to match the impressive magnification and produces a crystal clear view thanks to its high resolution. 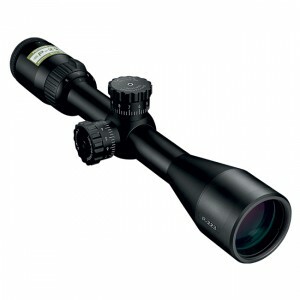 As suggested in the name Nikon P-233 3-9×40, the riflescope has an objective lens diameter of 40 millimeters. This makes it ideal for letting in plenty of light into the riflescope so that you can get a brighter view of your target. The Nikon P-223 has a great eye relief to make sure that when you are using a rifle with heavy recoil, the riflescope will not hit your brow. It is also beneficial when it comes to taking shots from angles that are not too opportune. The precision adjustments on the riflescope are unparalleled. They have a concise one out of four Minute of Angle hand-turn adjustment. The adjustments are made in tactical style with a zero-reset functionality so that you never have to keep readjusting if you are going to take the same shot. This comes in very handy when you have to fire repeatedly at your target. The whole optical system of the Nikon P-223 is multicoated. This means that you will always have bright viewing as it allows light transmission that is almost 100%. You will find this coming in handy in the wee hours of the morning or when darkness is coming in. To make sure that you will never have any moisture going into your riflescope, the interior is filled with nitrogen which is then sealed in with an O-ring. You will be able to take out your riflescope in any weather you choose to shoot in without worrying about a foggy lens. It is always important to have all the accessories that you can get for your equipment. With the Nikon P-223, one must have accessory is the Butler Creek 19 Eyepiece Flip Open Scope Cover . It comes with an O-ring on the inside of the cover that will go that extra mile to always making sure you never find dust or moisture on your lens. Nikon only has designed mounts that are specific for the P-223 series of scopes. The cheapest price we could find was on Amazon. You can simply get there by clicking here . This riflescope is perfect for various styles of shooting from tree stand hunting to shooting on the range. With the Zero-reset on the adjustments, all you have to do is put in your range, line up your target and then take it down. The only con that you will find with the Nikon P-223 is that it does not come with the flip caps to cover your objective lens. Click here to find current pricing and more information on the Nikon P-223 3-9×40 Matte BDC 600 Riflescope. The cheapest pricing we could find when we wrote this review was on Amazon.com. Check out our other reviews of leading rifle scopes if you want more in-depth analysis of different hunting scopes.